What are Adverse Credit Mortgages? Who are Adverse Credit Mortgages for? Need a Mortgage, but have Adverse Credit? Looking for Bad Credit Mortgage Advice? Looking for a Bad Credit Mortgage or Adverse Credit Remortgage? Please call us today on 0800 015 7776 or complete our Online Mortgage Enquiry and we will be pleased to assess the mortgage options which are available to you. Mortgage brokers with access to bad credit mortgages. Selective Mortgages were formed in 1999 and specialise in providing mortgages, remortgages and secured loans for clients who have past or current adverse credit registered. We have access to a number of specialist bad credit mortgage lenders who will consider applications that do not meet with the strict criteria applied by high street banks. We also have access to some smaller building societies who are able to consider minor adverse credit mortgage applications on a case by case basis by taking account of your overall circumstances such as credit history, deposit and ability to maintain the mortgage repayments. If you need a bad credit mortgage we can help. Each mortgage is assessed on an individual basis, but please note that as a minimum requirement, you will need to provide a deposit of at least 10% of the property value to be considered for these mortgages. Even if you have spoken to other mortgage brokers who have been unable to help you obtain a mortgage approval, please contact us as we have assisted many clients who have been declined elsewhere. 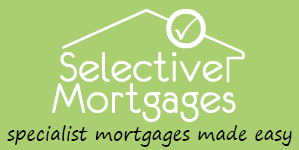 At Selective Mortgages we use our experience and expertise to identify the most competitive mortgage for you based on your circumstances and requirements. We represent your interests at all times and provide you with regular updates on the progress of your application to ensure a smooth transition from application to completion. How to apply for a mortgage with bad credit? These type of mortgages are suitable for people who are unable to obtain a mortgage with the mainstream high street lenders. Please call us today on our freephone number or complete our Online Enquiry Form and we will be pleased to assess the mortgage options which are available to you. Visit our blog for free guides and advice on getting a mortgage with poor credit. "Just to say thank you for arranging the mortgage for us. Now the everything is completed I just thought to drop you a line. Thank once again for your help. Much appreciated." "Just to say thank you for arranging the mortgage for us. Now the everything is completed I just thought to drop you a line. Thank once again for your help. Much appreciated." "Now that we're properly settled in our new home we wanted to say thank you for all your help over the past year. The whole process was very frustrating and we can't thank you enough for always being available by phone or email even when no-one else seemed to be responding. When the first property fell through we were disheartened but we felt confident that you would secure us another mortgage when the second house came up for sale. When we finally moved, the house immediately felt like home and our two boys settled straight away in their new room. Thank you for easing the process of buying our first home. We love it here." "Now that we're properly settled in our new home we wanted to say thank you for all your help over the past year. The whole process was very frustrating and we can't thank you enough for always being available by phone or email even when no-one else seemed to be responding. When the first property fell through we were disheartened but we felt confident that you would secure us another mortgage when the second house came up for sale. When we finally moved, the house immediately felt like home and our two boys settled straight away in their new room. Thank you for easing the process of buying our first home. We love it here." "Dear Phil, my mortgage has now completed. Thank you, it would not have happened without your expertise, forever grateful." "Dear Phil, my mortgage has now completed. Thank you, it would not have happened without your expertise, forever grateful." "Hi Phil, I would just like to thank you for getting me a mortgage. You made the process so much easier, I really appreciate it. I have completed today and have moved in, it's a little bit of a mess with boxes everywhere, but nothing I can't tackle in the morning. Thanks again, I will certainly recommend you to others." "Hi Phil, I would just like to thank you for getting me a mortgage. You made the process so much easier, I really appreciate it. I have completed today and have moved in, it's a little bit of a mess with boxes everywhere, but nothing I can't tackle in the morning. Thanks again, I will certainly recommend you to others." "Many thanks again for your help with the remortgage, was much appreciated and a great service." "That's great news about the mortgage offer being issued. I would like to thank you for all your help, you've been great." "That's great news about the mortgage offer being issued. I would like to thank you for all your help, you've been great." "Just to let you know my remortgage completed today. I wish to express my sincere thanks for all your help, I know it took a while waiting for the divorce to come through, but we got there in the end. It was a particularly stressful time, but with your reassurance that I could get a remortgage, I knew I could reach that goal. Thanks again and best wishes for the future." "Just to let you know my remortgage completed today. I wish to express my sincere thanks for all your help, I know it took a while waiting for the divorce to come through, but we got there in the end. It was a particularly stressful time, but with your reassurance that I could get a remortgage, I knew I could reach that goal. Thanks again and best wishes for the future." Please view our Disclosure Document for key facts about our services and costs.